The eternal question of man “What are we” – may finally in some degree be answered as we are starting to make more and more advanced robotic systems in “our own image” and we are testing them and finding their flaws. So far, we have no problem accepting the “first generation” robotics we all know about. “Robots” that weld metal on car assembly lines do not surprise us. The Honda robots that greet Japanese business man as they come to the office? No surprises here. But with the possibilities of embedded software introduced into the “internet of things”, we will have to realize that eventually, we will literally be surrounded by some form of “robotics”, sooner or later. And I for one welcome this – because I, like most humans, am lazy. Others fear that robots are going to “take over” any and all processes, jobs or services that can be programmed and in which there is a sufficient mechanical platform to carry out the instructions. They will operate 24hrs a day , 7 days a week and never ask for a raise and even other robots or machines will repair them. So, What’s the problem? Well how about this: What if the Robots go “Bad”. What if they malfunction? We are the programmers . We create the instructions the robots follow. We design the robots to do what we want them to do and we will have to test them to make sure they do what we intended them to do. In the 1970’s, a German band Kraftwerk wrote the song “We are the Robots”. The band used to behave as robots when they sang the song back then. Nowadays if they perform that song the band is sometimes replaced by human like mechanical robots that resemble the band members on stage. During some performances the audience has mentioned the effect that the band is “transformed” into robots. But maybe as robots are made by humans, and in this sense as we are ourselves are fallible , the robots will (or are) also be fallible. Is this possible? Sure it is. Some even begin to ask: if Robots take over, what will we needed for ? And if robots malfunction, who will maintain and fix them? Who will test these robots to be sure they work as intended? What ethical and moral conundrums arise if robots enter into intrapersonal aspects of our life and are “broken”? Will robots be used in the courts? As law enforcers? In war? In our hospitals? The answer is: They already are and they do encounter errors. And why ? Another easy answer: They are capable of doing repeated tasks without failure and are thought to be less prone to mistakes as they are free from “human error”. But they have the human errors built into their embedded software. The need to control the quality of such robotic systems in the future is going to be a challenging one. Who is going to test these systems before they are released to the masses? What skills will such testers need in order to cover the myriad of test scenarios that can and will occur when this technology is fully unleashed tothe public? It seems to me that we testers better start understanding better physics, electrical hardware engineering and finally: biogenetics. 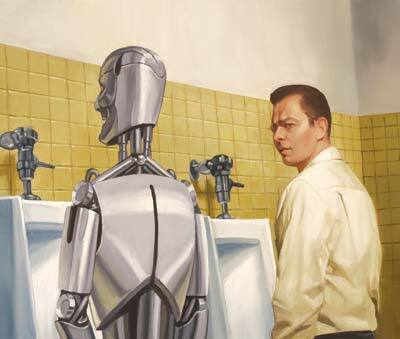 Perhaps robots are not fully “self-aware” these days. But they will be. This level of “artificial intelligence” is still just starting out. It will take some time. But it is inevitable. It is on course as Raymond Kurzweil ( the author, inventor and futurist) reminds us when he mentions that the “Singularity” is near, an event when artificial intelligence will exceed the human intelligence in terms of pure computational capabilities. Most people are not aware of the advances in robotics yet. The hardware and software is progressing quickly. Cars that can drive themselves, PHD candidates being offered for “Automating synthetic biology using robotics” (University of Edinburgh) in which liquid handling robots and other laboratory automation equipment will be synthesizing DNA. Can you imagine if a computer defect caused a Robot to miscalculate and “tamper” with synthetic DNA? How will we test that ? We would need to understand DNA, and lab procedures, etc. And I think that most of us Software Testers would be honest to admit that most of us are not at all prepared to test such systems. Yes, there are some Verification and Validation(V&V) or Quality specialists that might be able to take on this task but one thing is clear. Testing such future robots will require a variety of testers: Software testers for the AI aspects, mechanical engineer testers to test the Robot frameworks, and then the V&V and Quality specialists to verify the systems meet regulations and follow the codes and laws. So how will we test the “future” Robots then? As big teams with cross functional and multidisciplinary testers. There will be no other way, and certainly with testers who are motivated and capable of working with Robotics in its many facets. The answer maybe also lies in the context in which the Robots will be used. We will have to increase our technological and domain knowledge in which the Robot will be utilized. For the first generation robots, it was fairly straight forward. But after the “Singularity” ? How will we test a Robot that is more powerful in computational capabilities that the testers themselves? Maybe the robots will be “testing the (human) testers”. Another haunting part of the lyrics hints at the possibility of a Robot gone astray, no longer serving but getting its own conscience. Maybe we will never be able to test the super robots. We are prone to error. But maybe our “human error” is in itself perfect in its imperfection? I for one welcome the challenge to test these advanced Robotic systems and look forward to being able to answer the questions that this robotic technology will demand answers to. It’s not a question of “If” but “When” and it’s probable the time to meet the challenged is coming sooner than we all probably think. Daniël Maslyn is a passionate and creative software testing professional with over 15 years of experience in real-world situations ranging from hands-on operational testing roles to test management positions. Knowledgeable in a variety of test methods, techniques and testing paradigms.